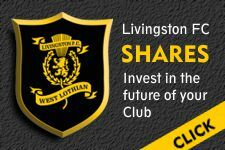 Livi officially secured their place in next season’s Ladbrokes Premiership with a comfortably victory over Hamilton at the Tony Macaroni Arena. Second half goals from Ryan Hardie and Craig Halkett ensured a dominant Lions performance was rewarded as they confirmed top-flight safety with six games to spare. There were three changes to the Livi starting line-up from the defeat to Hibernian as Ricki Lamie, Halkett and Hardie came in for Ciaron Brown, Hakeem Odoffin and Chris Erskine. Hardie almost broke the deadlock inside the opening minute when Alan Lithgow’s throw was flicked into his path by Declan Gallagher but he could only glance his header over. Scott Pittman almost latched on to Ziggy Gordon’s short back header but Gary Woods was out smartly to gather before Scott Robinson picked up a bizarre yellow card after his little finger barely made contact with Gordon. Great pressure from Craig Sibbald and Keaghan Jacobs then presented Hardie with a sight of goal 25 yards out on 16 minutes but he curled his effort straight at Woods. The visitors were forced into a change a minute later as Aaron McGowan was unable to shake off an earlier knock and had to be replaced by Alex Gogic. After Robinson’s cross was well cleared by the Accies defence, Lithgow’s ball in found Lamie at the back post and his volley cannoned off a defender and out of play. Jacobs’ resulting corner was headed home by Gallagher but his effort was correctly ruled out for a foul. After Lithgow picked up a 32nd-minute yellow card for a foul on George Oakley, the resulting free kick ended with a foul being awarded to the Lions. Livi then went close again five minutes later when a cross fell to Hardie and he smashed in a fierce effort that was brilliantly cleared off the line by Delphin Tshiembe. Hardie then headed straight at Woods four minutes before half-time as the teams went in level at the interval. The Lions made a change at the break as Dolly Menga made his first appearance since early February in place of Lamie and they made the best possible start to the second half as they broke the deadlock 47 seconds after the restart when Robinson played a superb through ball for Hardie and he coolly slotted past Woods. Livi then passed up a big chance to double their lead on 55 minutes when Hardie sent Robinson scampering down the right and he sent in a fine cross to the back post for Pittman but his downward header bounced agonisingly wide of the post. Former Livi man Tony Andreu then picked up a yellow card seven minutes later for a foul on Steve Lawson. The Lions were dominant and went close again on 62 minutes when Jacobs’ free kick was punched clear to the edge of the box and Sibbald saw his effort blocked on the line by a defender. Halkett then laid the ball off to Gallagher two minutes later and he sent a first-time effort just wide from 25 yards. The visitors made their second change on 65 minutes when Mickel Miller replaced Andreu and he was quickly involved, though not perhaps as Accies boss Brian Rice would have hoped as he picked up a yellow card for a foul in midfield within 60 seconds of coming on. Steven Davies then replaced Oakley four minutes later in Accies’ final change. Menga did well to win a corner on 75 minutes after latching on to Halkett’s ball forward and, after the cross was cleared, the return ball was met by Sibbald who saw his header comfortably saved by Woods. Livi weren’t to be denied, though, and sealed the points four minutes later. Sibbald turned provider this time with a superb left-wing cross that was powered home from six yards by Halkett as he set about signing off from the Lions in style ahead of his summer move to Hearts. There was a memorable moment for the Lions faithful nine minutes from time as Raffaele de Vita finally returned to first-team action after 11 months out with a knee injury suffered in the play-off semi-final against Dundee United, Hardie making way for the Italian’s long-awaited return. Stevie Lawless then replaced Robinson two minutes later. The visitors had rarely been able to lay a glove on the home defence but went close to pulling a goal back on 83 minutes when Miller burst clean through on goal but Liam Kelly produced a brilliant save with his feet before comfortably gathering Davies’ lobbed rebound. The Lions’ defence held firm for the remaining minutes as they eased to a tenth home win in seventeen games and ensured another season of top-flight football in West Lothian.